Lynn Coady was born in Sydney, Cape Breton, Nova Scotia and grew up in Port Hawkesbury, Cape Breton. She received a Bachelor of Arts degree from Carleton University and earned a Master of Fine Arts degree in creative writing from the University of British Columbia in 1997. In addition to a nomination for the Governor General's Award for fiction in 1998 for her first novel, "Strange Heaven," Coady's works have earned her numerous nominations and awards. Coady has taught creative writing at Simon Fraser University and in other venues, and she has worked as a freelance writer and journalist, publishing works of fiction and non-fiction in a range of anthologies and periodicals. She has also written several plays and a screenplay. The records were in the custody of Lynn Coady until their acquisition by Special Collections and Rare Books in 2005. A second accrual was received in 2011. 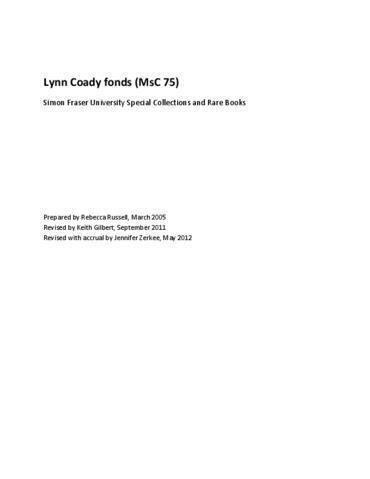 Fonds contains drafts and manuscripts of articles, short fiction, scripts, and novels, as well as originals and reproductions of Coady’s publications, notebooks, reviews and articles about Coady and her work, and other records related to Coady’s writing and editing activities and projects. The fonds is arranged in four series: Writing and editing ([199-]-2011); Publicity ([199-]-2011); Personal ([199-?-2010? ]); and Correspondence (1999-2006). The records were acquired from Lynn Coady in 2005 and 2011. Records in this fonds are under copyright. Researchers are required to secure permission from the copyright holders for usage of this material, except for those covered by “fair-dealing”. Series descriptions and a file list are available.